An image of the Victoria Crater on Mars was captured by the High Resolution Imaging Science Experiment on NASA's Mars Reconnaissance Orbiter. 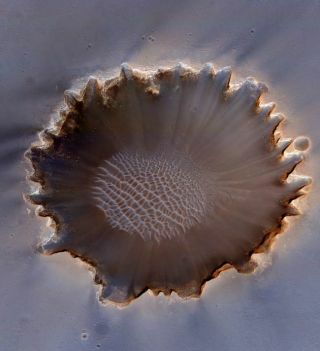 Animage of the Victoria Crater in the Meridiani Planum region of Mars was taken by the High ResolutionImaging Science Experiment (HiRISE) camera on NASA's Mars ReconnaissanceOrbiter. Theimage was captured at more of a sideways angle than earlier images of thiscrater. This view is similar to what would be observed by looking out thewindow of an airplane flying over Mars. The camera pointing was 22 degrees eastof straight down (east is at the top of the image). Themost interesting features of the crater are in its steep walls, which are difficultto see from straight overhead. A bright band near the top of the crater wall isespecially prominent in this view. The image's colors have been enhanced tomake subtle differences more visible. Earlier HiRISEimages of the Victoria Crater supported further exploration by NASA's Opportunityrover and contributed to joint scientific studies. Opportunity explored therim and interior of this 800-meter-wide (half-mile-wide) crater from September2006 through August 2008. The rover's on-site investigations indicated that thebright band near the top of the crater wall was formed by diagenesis (chemicaland physical changes in sediments after they were deposited). The bright bandseparates bedrock from the material displaced by the impact that dug thecrater. This view is a cutout from a HiRISE exposure taken on July 18, 2009. Some of Opportunity's tracks are still visible to the north of the crater (left side of thiscutout). Full-frame images from this HiRISE observation, catalogued as ESP_013954_1780,are at http://hirise.lpl.arizona.edu/ESP_013954_1780.The full-frame image is centered at 2.1 degrees south latitude, 354.5 degreeseast longitude. It was taken at 2:31 p.m. local Mars time. The scene isilluminated from the west with the sun 49 degrees above the horizon. The Mars Reconnaissance Orbiter is managed by NASA's Jet Propulsion Laboratory,at Caltech, for NASA's Science Mission Directorate in Washington. The HighResolution Imaging Science Experiment is operated by the University of Arizona, Tucson.